Want to discover more of how the Cross changed everything? This Lent, join Krish Kandiah as he invites you to travel back in time to stare intently at the cross of Jesus. Take time to explore the rich tapestry of meaning that surrounds this central and most defining moment in history. Over six studies, consider the final words of Jesus on the cross, as recorded in the Gospels. Each of these sayings can be seen as a unique invitation to connect with God. The leader's notes at the back will help small groups get the maximum benefit from these incisive studies. Cover to Cover Lent: Living Faith - Pack of 6 by Krish Kandiah was published by Eden bundles in January 2018 and is our 9110th best seller. The ISBN for Cover to Cover Lent: Living Faith - Pack of 6 is EDENBUNDLE-2056. Be the first to review Cover to Cover Lent: Living Faith - Pack of 6! Got a question? No problem! 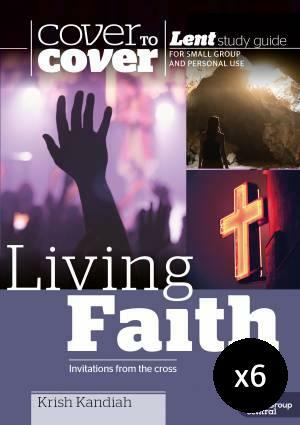 Just click here to ask us about Cover to Cover Lent: Living Faith - Pack of 6.